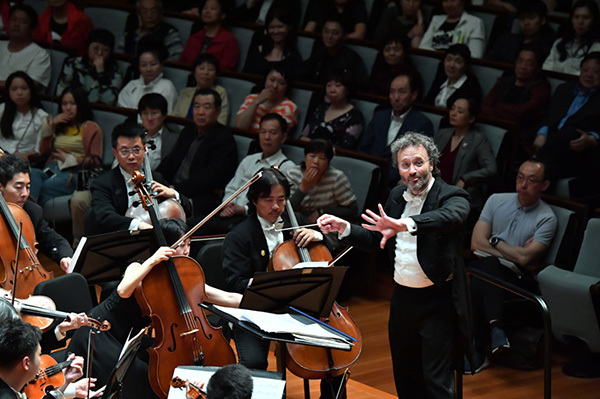 The passion of Italian opera and the lyrical poetry of Chinese song were beautifully paired Friday evening at the opening concert of the 18th Meet in Beijing Arts Festival. This year's festival features Italy as the guest country of honor, so the selections drew heavily from some of the most recognizable arias in the opera repertoire. Maestros Andrea Molina of Italy and Tan Lihua, chief conductor of the Beijing Symphony, alternated on the podium at the National Center for Performing Arts as they led musicians and singers through 16 pieces that ranged from classic arias to beloved Chinese songs. The event was organized by the Ministry of Culture, the State Administration of Radio and Television and the People's government of Beijing Municipality and presented by China Arts and Entertainment Group and the Beijing Municipal Bureau of Culture. The program opened with the Sinfonia, or Overture, to Gioachino Rossini's comic opera, The Barber of Seville. Molina led the orchestra through the piece, which introduces the audience to the key musical themes of the opera, with a gusto that was distinctly Italian. A series of arias from The Barber of Seville and La Pietra del Paragone (The Touchstone), and Il Trovatore, which is by another titan of Italian opera, Giuseppe Verdi, followed. Five talented young Italian singers - baritone Diego Savini, tenor Pasquale Scircoli, and sopranos Sara De Faviis, Anna Roberta Sorbo and Daniela Pini - admirably performed most of the opera favorites. Sorbo's performance of Una Voce Poco Fa, Pini's Stride la Vampa and De Faviis' Il Vecchiotto Cerca Moglie were a particular delight. But it was two Chinese singers, soprano Zhou Xiaolin and tenor Wang Chuanyue, who truly shined. Zhou's beautifully clear, bright soprano voice soared across the concert hall as she sang Tacea la Notte from Il Trovatore. Wang, a tenor who is a house singer with the San Francisco Opera, robustly sang one of opera's most famous arias, La Donna e Mobile, from Rigoletto. Tan, a renowned Chinese conductor, took the podium to lead the Beijing Symphony and its boisterous brass section through a powerful performance of the Overture to Verdi's Sicilian Vespers. In a short break from the opera portion of the program, violinist Lu Siqing took to the stage to perform Antonio Vivaldi's Summer from The Four Seasons. Lu was the first Chinese to win the prestigious Paganini Violin Competition and his skill demonstrated in this piece stands as a testament to his tremendous talent. It also gave the Beijing Symphony's string section a chance to stand out, especially in the concerto's final movement, when the music of soloist and strings unleashes the fury of the summer storm evoked in the piece. One of the high points of the concert, measured by audience applause, was Zhou and Wang's emotional rendition of the heartfelt song, China, I Love You. It's from the 1979 film, Hearts for the Motherland, and the song expresses the longing students abroad feel for home. Yet Pini and Scircoli's duet, Meeting at the Stone-heaps, sung in Chinese, brought the house down. Within the first bars, applause rippled through the concert hall, ebbed and then grew to a thundering appreciation by the song's end. The only sour note of the entire evening was that due to the position of the singers directly in front of the musicians, too often their exceptional voices were drowned out by the rise to crescendo of the orchestra. The gifted soprano Zhou was the only one whose powerful voice always rose above the instrumental music.